Saxo Bank, the online multi-asset trading and investment specialist, today announced an expansion of its network in the UAE with the opening of a representative office of Saxo Bank A/S in Abu Dhabi licensed by the UAE central bank. 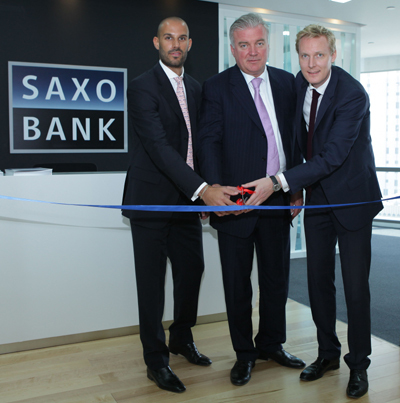 Saxo Bank was the first Scandinavian bank to establish a presence in the Gulf Corporation Council region, when it launched a regional office in the Dubai International Financial Centre (DIFC) in May 2009. The Abu Dhabi office will be headed up by Filippo De Rosa who will report to Jakob Beck Thomsen, CEO of Saxo Bank (Dubai) Ltd and Group Regional Head MENASA. De Rosa is joining the office, moving from a position as Assisting Director with Moody’s Analytics. This new office in Abu Dhabi has been established to further strengthen the bank’s presence within the region. “We are thrilled to be opening our second office in the UAE. We have seen operations expanding within the region rapidly since the opening of our first office in Dubai 5 years ago, and are delighted to be committing further to the Middle East and North Africa by entering Abu Dhabi. Saxo Bank offers investors access to 30,000 financial instruments. These include equity shares listed on over 30 global stock exchanges, 160 currency pairs, 8,700 CFDs, 1,500 ETFs and ETCs, futures and more. These instruments are all readily available through Saxo Trader, a desktop version of the platform, the browser-based Saxo Web Trader and also through Saxo Mobile Trader – a platform designed specifically for mobile devices.